There’s something about being on a boat that makes from for good cinema. Perhaps it’s the seclusion from the public, the diversity of guests and characters, the theme of neutrality or even vulnerability on the open seas. Stanley Kramer’s 1965 adaptation of Katherine Anne Porter's novel, is a big ol’ glossy Hollywood production - "Grand Hotel" on the Seas - an oddly infectious piece of Hollywood melodrama. It’s 1933 and a cruise ship departs from Veracruz Mexico bound for Germany. On board are a varied group of intellectuals, political refugees, artists and romantics. Director Stanley Kramer takes us deep into the relationships and conflicts of a dozen passengers. For 28 days the ship exists as a microcosm of the political and social conflicts. With the threat of war on the horizon, and in the midst of the Depression, the petty prejudices and chauvisms contrast the state of superiority nationalism in the world. Jose Ferrer's bombastic German businessman character who heads an upperclass clique that alienate the Jewish guests provides the obvious foreshadowing of the Holocaust. 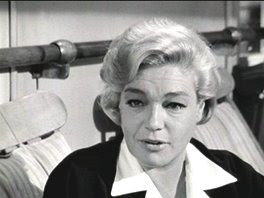 Simone Signoret plays an exiled Spanish socialist exile looking to kick her addiction to sleeping pills. She falls in love with the equally anguished ship's doctor Wilhelm Schulman (Oskar Werner) and their sparks provide the most interesting subplot. Some stories don't stand the test of time though, specifically Lee Marvin's washed-up and racist ballplayer suffering from alcoholism and George Segal and Elizabeth Ashley's relationship squabbles are the stuff you fast forward over. The wonderful dwarf actor Michael Dunn gives the warmest performance as the humble gentleman outsider who introduces us to the characters and every once in a while addresses the camera to give his own personal comments on the events we seen on screen. At 150 mins, it’s a long film, and like many epics of its era it does wears out its welcome. Where “Ship of Fools” doesn’t succeed, is in increasing the stakes and conflict in the final third. As the ship gets closer to its destination, the conversations continue at the same pace as before. The resolutions of the individual plotlines are satisfactory and provide adequate closure, but considering the early Nazi-era time period there was much more room for greater hindsight perspective. "Ship of Fools" is part of the Stanley Kramer Collection from Sony Pictures Home Entertainment - a fine collection of Hollywood classics from the great producer/director.